Solar Panels San Jose: Can I Afford Them? Can I Afford Solar Panels? While having a passion for the environment and hoping to save a little money are both awesome reasons for looking into solar panels, many people pause when they see the upfront cost. Though most people know about the possible benefits they could reap from a solar installation, most don’t have the money to pay for everything up front—even with all the potential savings. With that said, are there any ways to afford solar panels without going into debt? Will solar panels help you save that much money in the long run? The professionals at West Coast Solar, Inc. are here to help you make your decision. Contact us today to see how we can improve your San Jose home! Are there any solar financing options available? Absolutely! We want to help anyone interested in solar power figure out their financial situation and pick an option that makes sense. We offer several arrangements while still keeping in mind what you need for your family, what your current financial status is, and what will maximize your solar energy savings. Finance a solar energy system. Owning a system is a popular option, and it isn’t hard to see why! First, it allows families to take advantage of the tax benefits with a federal tax reduction. While you may not assume it’s much, you would be wrong—it’s a 30 percent tax credit. Second, solar panel installation is guaranteed to increase property value. In many cases, owning a solar power system is one of the top ways for homeowners to save money on both their bills and their taxes. More and more lending institutions understand the value of investing in solar power, which is why they are happy to do so. Many community and regional providers, and occasionally national banks, offer solar loans to both businesses and homeowners. PACE programs have been put in place to help offset the initial cost of installing a solar power system. This is a way to get a loan from municipalities, and it allows property owners to make payments towards these loans alongside their property taxes for about 10 to 20 years. This way, they can pay off the new solar panels slowly while still reaping the benefits while in their home. If you would like to get the low energy rates and benefits of using clean solar energy, this is a great way to do it. We understand that not everyone can afford to purchase a solar power system, and others are looking to move within the next couple years, so leasing is the better option. If this sounds like you, let us know! We can explain all the possible financing and ownership options to choose a method that makes the most sense. What is the best way to choose? Unfortunately, there is no one-size-fits-all option when it comes to choosing how to finance your new solar system. With that said, you can meet with professionals who are knowledgeable about financial concerns and your budget. Reach out to us now, and we would be happy to help! 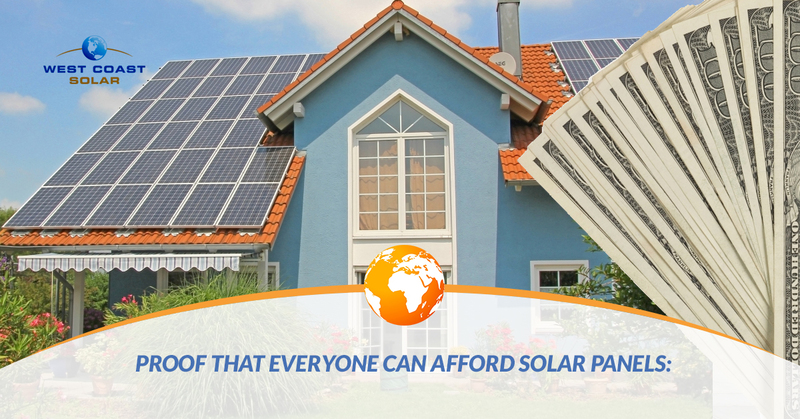 We at West Coast Solar believe in finding ways for everyone to contribute to green energy, even when you can’t quite afford to purchase your panels in one big sum. Contact our team of professionals to get started and discuss your financing options.